I live in a town of some 200 people. I hate the people, to go shopping for groceries you need to go to a different town, to buy anything other than groceries you have to go to a town that is even further away. The location isn't bad, it's just too small. The town "even further away" is in the same area, but has just the right size (1000-2000 people, maybe?). I'd much rather live there. the smallest town i lived in, was two weeks in Grong (hehe, awesome name right?) of 2500 people, even here, "everyone knows everyone" altho i didnt stay for long enough to know anybody at all. I grew up in Houston Tx..i have lived here my whole life, save for a brief attempt at living in New Orleans. The size of Houston does not bother me..there are just parts of Houston that I never see, and the neighborhoods are kinda like towns. Houston sprawls out in all directions. I rarely leave the inner loop of the city and I ride my bike everywhere. I would not mind living in a sufficiently artsy, unpretentious low cost of living small town if I had a reason to move there, but I don't know. i have gotten teased by old friends for never having left here. i quickly learned that about big cities, when i started to get to know valencia, the home of my spanish family. the city may be big, but people will usually stick to their neighborhood, as most neighborhoods will have local shops, restaurants, etc. myself i stick to the neighborhood of campanar 95% of the time, except when my dad drags me off to the inner city, to "explore"
Big cities are definitely my kind of environment. I voted large city, but a regular city or very big city would be just as suitable. I love the anonymity, the fact that nobody gives you a second look, people are to busy to talk to you (even if you live right beside them), there's less chance of running into somebody you know and sitting on your own in a cafe/park/wherever isn't seen as strange. Oh, and then there's the chance for people watching! I also like the constant hustle and bustle and the idea that 'the city never sleeps'. More to do and always somewhere to go at any hour. Small towns are hellish. And I wouldn't even want to imagine what it would be like stuck in a village. And in the passing of momentary stillness. We can see our chaos in motion. I do prefer big cities too - Everything I need is within a walking distance and the most I want too - the rest is easily reachable via public transport or via cycling. I grow up in the country side in small village: The supervision of village community was tremendous: Everyone knows everything from everyone. Going to the village shop, the butcher, the baker, the post office or one of the three pubs and were well informed regarding the newest gossip. That can be fine if live and behave according to the village standards - it even provides you with an extra social network; if you do not confirm to this standards, this could turn easily into hell. Being a person very much for my own, I do not prefer to play the role of the village eccentric (or idiot) and I am happy that I left this place quite early. Location: A cold place with lots of blondes. Where is the "I am legend" - Very Large City (0 people or less) choise? I currently live in a town with 100K people in it. I have lived in a small town and it sucked because it had no stores or anything and you had to take a bus to another town to be able to buy things. Only restaurants in town was a pizza place. I prefer big cities (even if they have too many people in them) because of all the fun things you can do. There are sidestreets that one can take to get away from people.. Even living in a small town, within a small street I felt like like some sort of local oddity. It's amazing how quickly words spread about the strange person who keeps to themselves. It's nearly as if small communities are offended by someone who doesn't conform to their standard of normality - Like it's some act of rebellion, shunning the group and refusing to be part of the herd. And of course, the more they pry, the more we withdraw and go our own way. I also think we can produce an element of unease and wariness among small communities, due to people's unfounded fear of loner types and so-called oddballs. Oh no, I can recognise no more than ten people in town. I don't really mingle with them. I think they know each other quite well, though. I find college towns quite comfortable. The large floating population provides a certain level of anonymity unavailable in an ordinary small town. Interesting people, decent range of resources. Less sensory overload than big cities. I live in a "small town" near a "large city". I hate it. I'd rather live somewhere much smaller. Hmmm... I live in a small town near a large metro area and I love it! I really don't need to leave my comfortable little world, but if I need something rather specialized, I have lots of resources fairly nearby to get this. I live minutes from a National Forest and two wildernesses when I want to disappear, am probably about forty minutes each from the desert and the ocean, but not too far from big theaters. Real public transportation now reaches this far and I can ride my bike to the train. I am a true child of the suburbs--not at home in big city, but not comfortable with the lack of resources in rural areas. There is no wilderness near me. There's nowhere to escape to. I went to a small college with no town to speak of. It was fantastic, although I saw that if I managed to make an enemy, it would be impossible to avoid them. 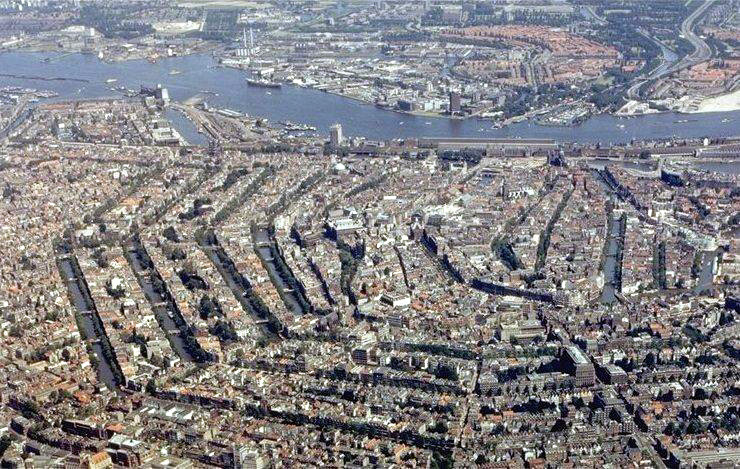 A picture of the city I like best: Amsterdam. I didn't take the photo myself. I just thought it was a good looking aereal photograph of THE city. The city itself is quite small, between 700,000 and 800,000. It has just the right size and everything (almost that is) is woithin walking distance: theaters, museum, night life etc. The region of Greater Amsterdam has app. 2 million residents. I live in a small town (75,000) which now has almost become a suburb in its own right, 30 min. from Amsterdam's city center. Give me a small town any day, with nearby forests. I hate the urban jungle and the glaring desert landscape. Heart of the guardian, way of the warden, path of the exile. I said " Large City " just to say something . I don't know , a part of me wants to be in New York City...1973-1983 ! !! !! !! !! !! !! !! !! !! !! !! !! !! !! !! !! !! !! !! !! I guess S. F. is not quite " large " , population-wise ???? ?